Let’s travel back several hundred years now to a time before European immigration to what is now the United States; , it’s developed by Inspired Gaming, it’s called Chief! and it’s eponymous character is the cheerful leader of a tribe who have plenty of features to hand out – find out how it works below. Chief! is a five reel slot with three rows and twenty fixed paylines; the symbols spin on what may be animal hide strung in a red frame and floating against a backdrop of grassy plains, mountains and blue skies. The high value symbols are the game’s logo, a pair of buffaloes, a tepee, a dream catcher, a pair of tomahawks and a bleached skull; J, Q and K make up the lower values. The chief’s headdress is wild and it will substitute for all others to help form winning combos except for the Chief bonus symbol. This is an optional bet which will add 50% to your stake and which doubles the height of the bonus symbol, making it easier to trigger the main feature. Wild Winner – The chief will add more wilds to the reels. 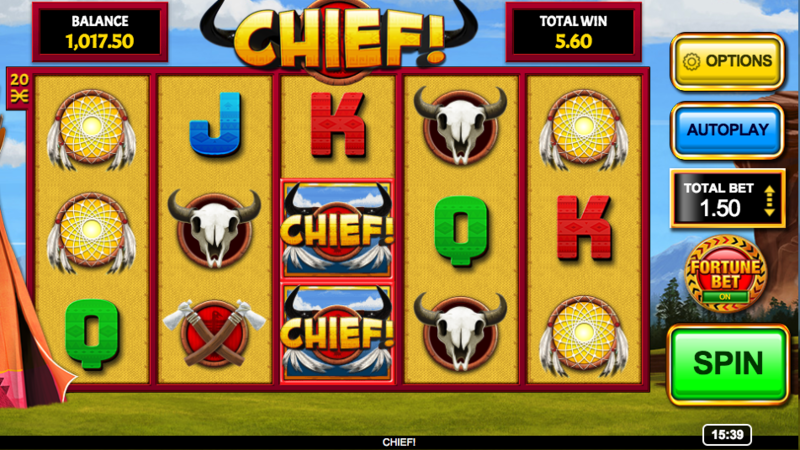 Bonus Chance – Buffaloes stampede across the screen and may leave extra bonus symbols on the reels. Big Win – a win of least 20x your total stake. This is triggered by landing three or more of the chief bonus symbols anywhere in view. Three or four triggering symbols may award Buffalo Bucks, Buffalo Drops or Boosted Buffalo Spins; five triggering symbols will award just Boosted Buffalo Spins but of a higher value. Buffalo Bucks – place items on the buffaloes back to climb the cash ladder and reach the safe zones; the win can be collected at any time but overloading will cause the prize to drop to the last safe zone. Buffalo Drops – try and guide two buffaloes across two sets of bridges; one buffalo surviving wins a prize and two surviving pays a bonus. Buffalo Spins – awards a choice of free spins and multiplier values with an extra enhanced multiplier wild on the reels. 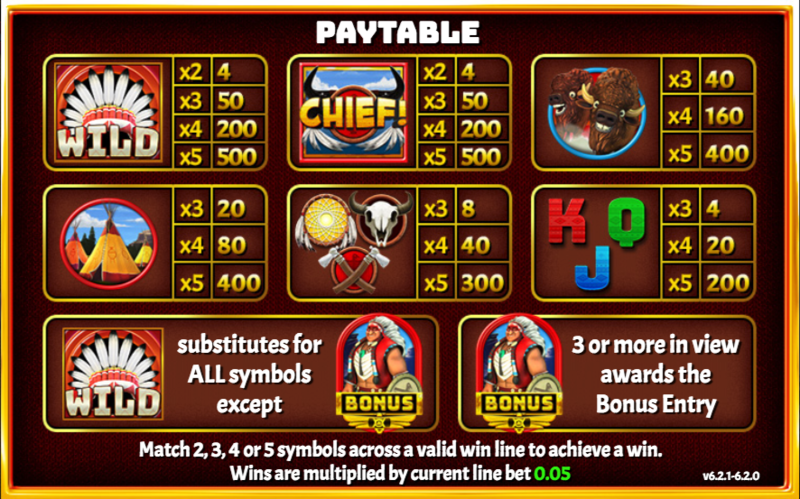 Boosted Buffalo Spins will always award the highest number of spins with maximum multiplier value. Chief! is a colourful, cheerful, larger than life slot with a large number of bonus features and an extra bet option which makes it a little easier to trigger the main feature. Even if you find it tricky to do that there are big wins to be gained from the Reel Modifiers. This game comes with an RTP of 95.00%.